The open mic moves to the Twisted Hop in Woolston! Come join us for some mighty fine craft ale and food - and of course, poetry! First Tuesday of the month. The Republic of Oma Rāpeti Press is proud to announce the first of a new series of poetry anthologies to complement the on-going publication of Catalyst. Inspired by the legendary Penguin Modern Poets series, the Republic of Poets will be a showcase of three emerging New Zealand poets, allowing a broader sample of poets' work to be presented beyond the limits of even a 'feature' slot in Catalyst. We've been working on this idea for a while and it's now time to let the ol' cat out of the bag. Volume One of Republic of Poets is subtitled: 'Pioneers' and features three poets who have been something of latter day pioneers in the renaissance of performance poetry in Christchurch (and is a nicer way of referring to our inaugural feature poets than 'guinea pigs'). Republic of Poets Volume One 'Pioneers' features the work of Ben Brown, Andy Coyle and Doc Drumheller. It's been a labour of love for Oma Rāpeti and we're pretty proud of the resulting book which has been partly funded by Creative Communites Christchurch City. The book is being launched with a short tour of the upper South Island by the impressive live show of the three poets. Below is the media release - feel free to spread the word and if you can't make it to see the show, write to us to buy your very own copy. The Republic is Coming - Long Live the Republic! 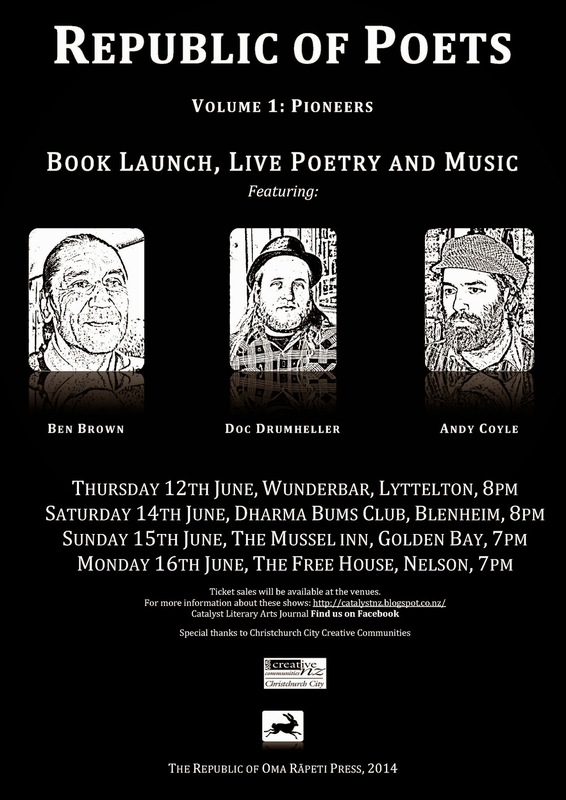 Christchurch poets Ben Brown, Andy Coyle, and Doc Drumheller will raise the flag of a new republic with poems and songs when they launch a combined collection of poetry and other writings in June. The Republic of Oma Rāpeti Press publishes Catalyst literary arts journal, founded by Drumheller in 2003. The press will publish the new anthology from the three poets as part of their new ‘Republic’ venture. The on-going project will produce a high quality literary anthology of three New Zealand poets each year. Republic of Poets Volume 1: Pioneers, is funded by Christchurch City Creative Communities. “The project is inspired by the Penguin Poets series of the past”, explains Doc Drumheller. “The launch in Golden Bay and Nelson of this initial collection will be the Republic’s first venture and will be complete with a flag, constitution, and national anthem! You won’t want to miss it! “We have a continuing interest in experimental and non-traditional forms of poetry and writing often neglected in literary journals,” says Doc. Each poet brings to the performance their own particular take on the literary world. All three are established writers and performers in their own right who have earned various awards and have chalked up many accomplishments throughout their careers. Such has been their skill and enthusiasm for their writing and poetry craft, that they have earned themselves some status as pioneers in the field of performance poetry in Christchurch and have established themselves on a national and international level. Ben Brown (Ngāti Paoa, Ngāti Mahuta) was born in Motueka in 1962. He is a writer, poet and performer. Since 1992 he has published numerous children's books, short stories for children and adults, poetry and non-fiction, and is an occasional contributor to Mana Magazine who have also featured him. He tours and performs regularly around the country. In 2006 he won best picture book with the artist/illustrator Helen Taylor in the New Zealand Post Book Awards for Children and Young Adults. In 2011 he was the Maori Writer in Residence at the Michael King Writer's Centre. He was also writer in residence at Hagley College, Christchurch, in 2009. He has read and performed at the Auckland Writers Festival (2010), the APRA Music Awards (2011) the Christchurch Writers Festival (2006, 2012), the Kaikoura Roots Festival (2012) the Christchurch Arts Festival (2009, 2013) and the Nelson Arts Festival (2011). He lives and works in Lyttelton. Andy Coyle is a performance poet based in Canterbury, NZ. In 2011 he represented Christchurch in the NZ Poetry Slam finals. He is a regular contributor to the Catalyst Open Mic Night, The Catalyst Literary Journal, and the Catalyst Road Show. Career highlights include, a ten date tour of New Zealand in 2010; writing and performing an epic poem set in Christchurch accompanied by a 7 piece progressive jazz/rock ensemble for the Dunedin Fringe and the Wellington Jazz Festival in 2006; a short story filmed; a play performed; a poem painted as a mural in the seaside suburb of New Brighton and festival appearances in the Wanaka ‘Outspoken Festival’, the Lyttelton Summer Festival, and the Newtown Street Festival. Doc Drumheller: was born in Charleston, South Carolina and has lived in New Zealand for more than half his life. He has worked in award winning groups for theatre and music and has published ten collections of poetry. In 2007 he participated in the 12th Havana International Poetry Festival, where he was asked to represent New Zealand on the International Board of Poets in Defence of Humanity. In 2009 he participated in the 5th World Haiku Association Conference and The Druskininkai Poetic Fall in Lithuania, where he became the New Zealand Ambassador to the Republic of Užupis. In 2010 he participated in the World Haiku Festival Pécs, Hungary and won first prize in the ginko haiku writing competition. In 2011 he travelled to India where his book ‘In Transit’, 100 haiku in 11 languages, was published. He performed poetry and music at the Cyberwit office in Allahabad and at the Sahitya Akademi in New Delhi and then went on to represent New Zealand at the 2nd Tokyo International Poetry Festival and 6th World Haiku Association Conference in Japan. In 2013 he performed in Sofia, Bulgaria with the Bulgarian Rock Band, La Text launching a feature of Bulgarian poets in Catalyst Volume 10 and Contemporary New Zealand Poets published in Sofia’s Literary Newspaper. He represented New Zealand at the 7th International Haiku Festival Constanta, 2013 Romania. He won 1st prize for the festival haiku writing contest, 2nd prize in the festival anthology contest and was awarded a diploma for excellence in haiku, from the Constanta Haiku Society. He lives in Oxford, where he edits and publishes the literary journal Catalyst and teaches creative writing at the School for Young Writers.